Good Fun! Still made with all natural oil. Naturally Delicious, every Lays potato chip is perfectly crispy and delicious. Happiness in every bite. Ricas y Divertidas! Preparadas con aceite natural. Naturalmente delicioso, cada papita Lays es perfectamente crujiente y deliciosa! Felicidad en cada mordida! Ingredientes: Papas, aceite vegetal (de Girasol, Ma�z, y/o Canola), Condimento de Lim�n (Mlatodextrina [de Ma�z], Sal, �cido C�trico, Az�car y Saborizantes Naturales [Incluye Saborizante Natural a Lim�n]). the item was great however this time they didn't do well in transit all the chip were broken into crumbs. ProsThey are shipped so well to minimize breakage. delicious! We need these in our area. I love these chips!!! My fiance found these online and suprised me with these, I was so shocked since I have looked everywhere for them. Ever since then I always buy them from here, do hate to see how the price has gone up over the year from 3.99 to 5.29 but I do love eating them!! My family loves these hard to find chips. Wish we lived where we could buy in store but thanks to MecGrocer.com we don't have to go without!!! Thank you MexGrocer for the free shipping !! Gracias! 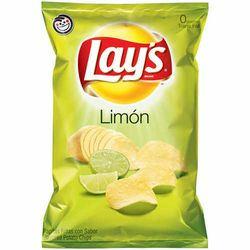 if you like the taste of lime you'll love these,too bad i can't get these in my area. Lay's Limon chips are absolutely the best chip EVER! They are no available where I live, so I'm very happy that I've found MexGrocer! The shipping is always prompt, and the chips always arrive in great shape - carefully packaged! Thanks MexGrocer! If you haven't tried these you have no idea what you're missing!!! I'm sorry to see that the price has increased 30 cents a bag, but I will still buy them because they are just that GOOD!! These chips are SO addictive, the best ever! The only chips I eat. I discovered them when I was out West. I live in Michigan and you can't but them here. I am so happy that I can order them from Mexgrocer.com. These are (in my opinion) by far the best potato chips lays make. It is a shame that all of cities and states in the U.S. DON'T SELL THIS PRODUCT. My question to lays is WHY NOT??? Come on, let"s get it done. Don"t tease me!!! can't get these in my area and can't affort to fly to TX and CA to get them! Was thrilled to find them at mexgrocer. They are delicious - I've never found another chip that tastes so tangy and yummy. These are the BEST chips ever.I will be ordering these all the time and i have to stock up for the summer cook outs..
No other chip compares! I live in Illinois and I have several friends who agree - but we can't purchase these chips in our area...and so - I always order from mexgrocer.com! The service is worthy of the chips....EXCELLENT! I'm originally from California and was lucky enough to be home for the summer and i had to have these chips almost everyday. I'm now back in FL and cannot find them anywhere! I have to have family bring me a few bags when they come to visit or order them online! Come on Frito Lay start selling these everywhere!!! I am addicted to these chips! People either LOVE or HATE them. But you won't know till you give them a try! I agree with all the other reviews ~~~ these are soooo good! I cannot buy them here though, so it was great to be able to order them. I paid for the quicker shipping, and they arrived just when expected and in good condition. Thank you, Mexgrocer! LOOKED EVERYWHERE FOR THESE IN AR AFTER HAVING THEM IN TX BUT TO NO AVAIL! WTF FRITO LAY??? WHY CAN'T ALL AREAS GET THE SAME PRODUCTS. QUIT WITH THE DEMOGRAFICS ALREADY! I HAVE TO ORDER THESE FROM CALIFORNIA TO GET THEM! THANK GOD FOR MEXGROCER.COM! These are AWESOME! Just ordered 3 bags for my deployment. I share them with everyone and they are famous!!! I could eat the whole bag by myself. Born and raised in California - moved to the MIdwest and I was NOT able to find these - or my other faves lime-chile cheetos.... booo hooo!~ THank goodness for the internet! I can not STAND Dill Pickle Lays but the Lemon ones are the bomb. I am going to order them and share them and get other people to request them! We also found these on a trip in California. I LOVE these chips! Lay's needs to get their heads on straight and sell them everywhere! Found these in the west coast, they aren't sold in my area. WISH THEY WERE. They are SO GOOD!